We’ve been to the desert and the inland sea with all our visitors. This year we went on Christmas Eve. This short video, at 4 times normal speed, gives an idea of driving (in our case being driven) across, up and down the dunes. 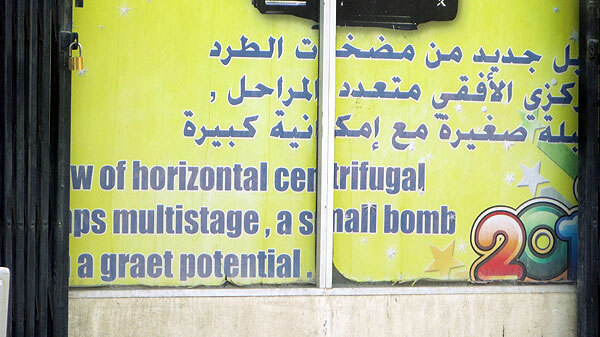 I am not quite sure what they are selling here – but I hope there is also something else lost in translation. Today is the 18 December. We have just returned home after watching the National Day Parade. 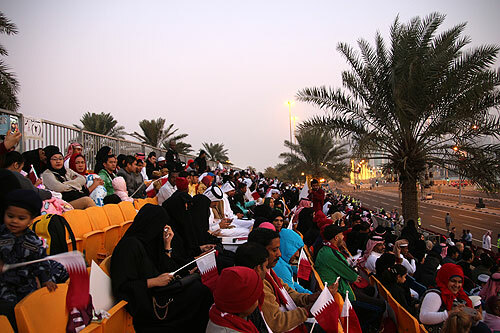 We started the day by arriving on the Corniche at 6am to ensure a seat. Last year we made the mistake of being on the waterside, which meant standing for over four hours and being crushed as everyone strained for a view. This year was the most well organised we have attended. There was much more seating available. Not only did it start precisely on time, but it was also more compact than in the two previous years. The parade of children started at 7.30am, whereas in previous years it was tacked onto the end when everyone was ready to leave. The last two parades appeared to include every soldier and every piece of military hardware in the country. I’m not a military tactician, but I am guessing that concentrating all your soldiers and guns in a one kilometre stretch of the city at the same time is not a good idea… this year there were just fewer of everything. Each branch of the military was represented by only one block of marching servicemen. Behind us sat a Qatari man with his five daughters and one son. When the National Anthem was played, his entire family proudly and loudly sung the words. We chatted to him as we watched the soldiers march by. He asked where we were from. He seemed pleased we were from the UK. He then talked of the British media and its regular attacks on his country. He seemed genuinely bewildered and hurt by all the negative press. He knew his country was not perfect. He was pleased that we enjoyed living in Qatar, and to see all the different nationalities who had made Qatar home, albeit a temporary one, together for his county’s National Day. The parade was over in 45 minutes. I enjoyed feeling part of the celebrations. Yesterday early morning, Friday 12 December, was the full dress rehearsal for the National Day parade on the 18 December. Roads around the Corniche were closed while the practice took place. That was just the time I was in Monoprix doing the weekly shop. This supermarket is in the business district with the Corniche on one side and Majlis Al Taawon Street on the other. When I came out the the supermarket, the road leading to Majlis Al Taawon Street was closed. I headed off to one of the other exits… closed. A small convoy of cars headed round to each exit but they were also all closed, some with barriers, others with barriers and a police Landcruiser. As many of the exits were one-way streets, we all had to drive back against the traffic. Eventually I got back to Monoprix where I parked up for 10 minutes. I am guessing that one of the Qatari drivers who was trapped with us got through to someone with influence. For a short time the barrier was opened and we all escaped. Drivers in Doha frequently use their horns to tell you that they have had enough of waiting in the traffic jam. Usually it has no effect in getting the forty cars in front to magically part like the Red Sea and let them through. This is what a traffic jam in Doha sound like… however in this instance the power of the horn got the traffic moving. West Bay is a maze of high-rise steel and glass structures. There is an ‘anything goes’ feel about the way 21st century Doha has been built which, for me, makes it far more visually appealing than over-planned cityscapes. 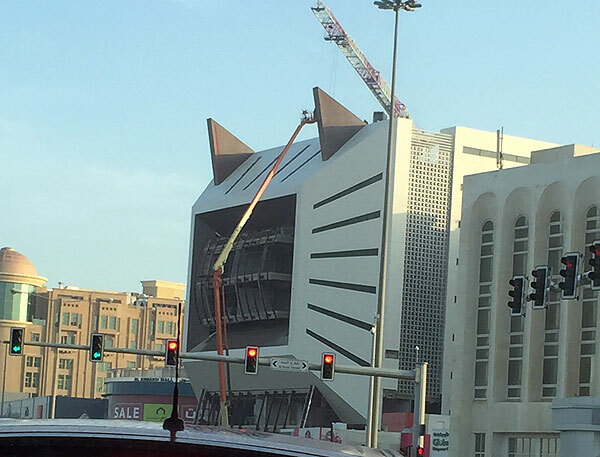 Not far from where we live, opposite the Centrepoint Mall in Al Sadd, a new building is under construction. It looks just like a cat. It makes me smile every time I drive by. 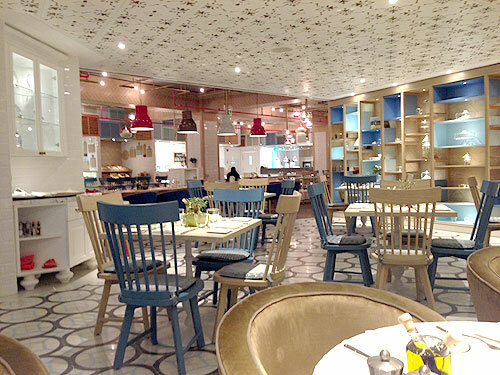 Three new eateries have recently opened in the Barwa complex on the C Ring Road just behind our apartment block. Two others are due to open at some unspecified time in the future. It’s impossible to identify what the one next to the coffee shop on the ground floor will be, as the hoardings give nothing away. On the first floor ‘India’s best Chinese Restaurant’ is being built. 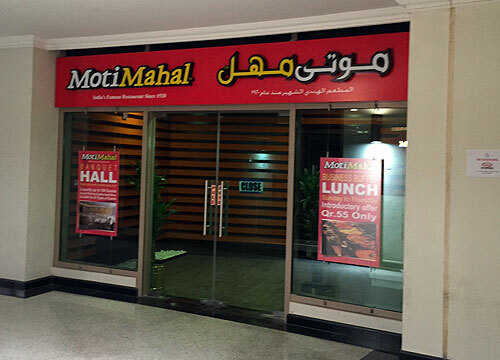 Also on the first floor is a Filipino fast food restaurant which we have not tried. We had a take-out from the Indian restaurant, also on the first floor, yesterday. We won’t be going there again. The one that wins for us is French Olive. Although the name says ‘French’, they confusingly specialise in Italian food and have an Italian chef called Francesco. For the first few weeks after opening it appeared to have few customers. I went there to check out the menu and was pounced on by staff as a potential customer. A few weeks later we decided to see what it was like to eat there. Inside, it’s tastefully designed and modern. It was still quite empty, but it was quite early in the evening. 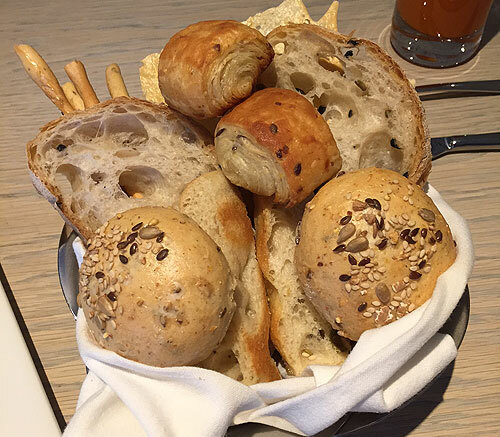 The bread for while you wait for your food is exceptionally good. I can recommend the pizza, the best I have had in Doha, which I have now eaten on the first two occasions we went there. The third time I ordered steak. One of the managers commented that I’d not gone for the pizza this time… ‘Francesco will be devasted‘ she said. Below is a photo of Francesco prior to devastation. It also has a bakery with freshly baked bread, croissants which we pick-up on Friday mornings after our walk… it also has a huge range of very fancy patisserie. I am told that weekend breakfasts are very busy and getting popular with the locals. 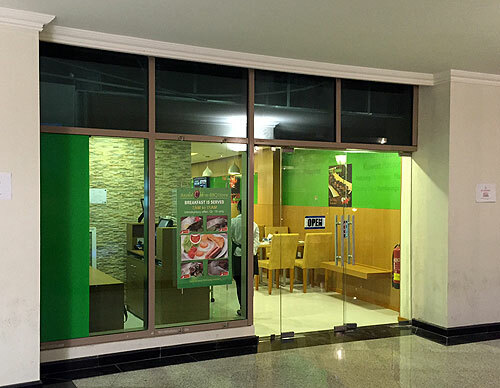 It’s not inexpensive but good value, good food and friendly staff who are eager to please. It’s also a two-minute walk from our flat. For our next visit it will be pizza to keep Francesco (and me) happy.